Yogi Berra passed away last week at the age of 90. One of the greatest baseball players of all time, Berra was probably known more for his funny sayings (so-called “Yogi-isms”) than he was for his impressive career as a New York Yankee that lasted from 1946 until 1963 and included 3 MVP awards and 10 World Series championships. Some of these Yogi-isms are relevant for investors, including: 1) it ain’t over ‘til it’s over, 2) déjà vu all over again, and 3) the future ain’t what it used to be. Berra also famously once said, “Make a game plan you can stick to…unless it’s not working.” Here we try to help investors come up with a game plan for the stock market that may work. 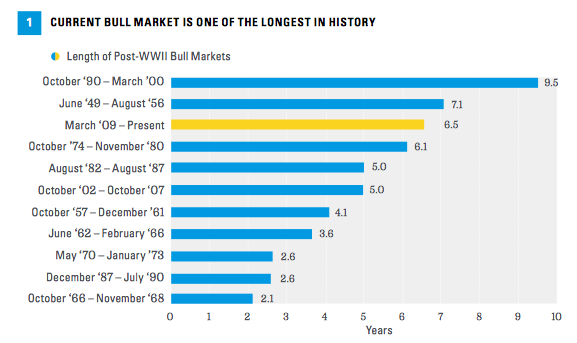 The now more than six-and-a-half-year-old bull market, one of the longest in history [Figure 1], feels old to some. But bull markets don’t die of old age, they die of excesses. Currently, we do not see evidence of the types of excesses that have historically led to recessions and ended past bull markets, such as overborrowing, overspending, or overconfidence. In addition, we continue to watch our favorite leading indicators for evidence of a potential impending recession and bear market, including what we call our “Five Forecasters,” among others. We are not seeing particularly worrisome signals from any of the indicators we follow, and one indicator that may be flashing yellow, stock market valuations, is less concerning following the latest correction—the trailing 12-month price-to-earnings ratio (PE) has dipped to 16.3 [Figure 2], roughly in-line with the average going back to 1980. Another key indicator that is not firmly in the positive zone is the Institute for Supply Management (ISM) Purchasing Managers’ Index (PMI), which is a measure of business sentiment. At 51.1, that index is still above 50 (the breakeven between contraction and expansion) and is currently being dragged down by the energy downturn and the strong U.S. dollar, two factors that we believe are transitory. 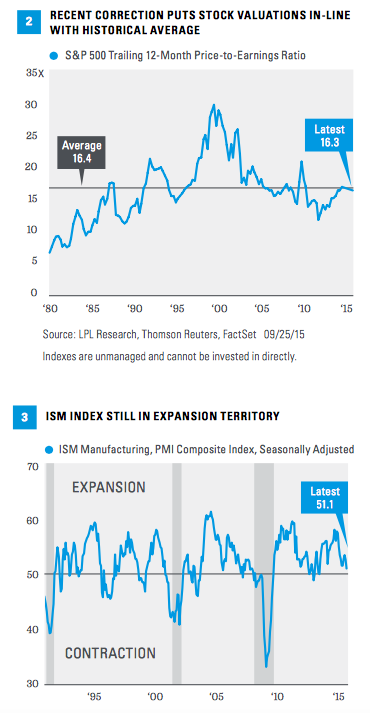 Note that the ISM index was at a similar level, between 51 and 52, during the last S&P 500 correction in 2011, before subsequently rebounding along with stocks. We saw similar dips in the middle of the prior two economic cycles in the mid-1990s and mid-2000s, as shown in Figure 3.
is quite similar to the 2011 move. On the surface, this may seem concerning. Should the same pattern hold, stocks may have as much as 10% more to fall. 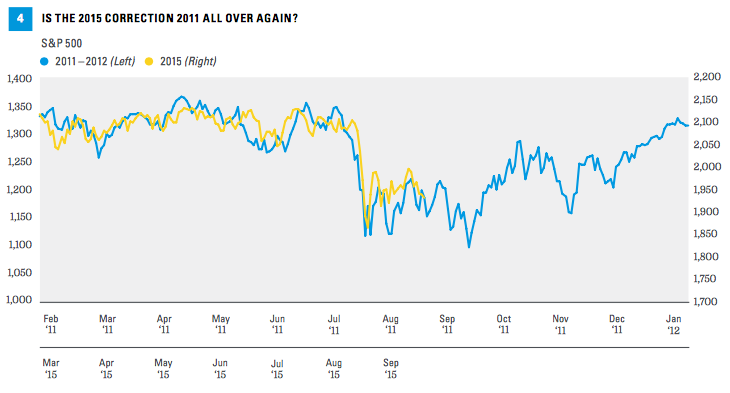 However, the good news is that in 2011 stocks recovered their losses within three months. In addition, markets were dealing with bigger challenges then, including the downgrade of the U.S. government’s credit rating and potential breakup of the Eurozone. We believe the U.S. economy is in better shape today, while the Eurozone and Japan are surely better off. China is not growing as fast today as it was then, but it has much less impact on U.S. economic growth than Europe and Japan. This famous Yogi-ism probably applies better to the bond market where low yields, such as those we have now, have historically signaled low future returns, well below bond returns of recent decades. But equities also may not enjoy a particularly bright long-term future based on the historical relationship between PE ratios and 10-year stock returns [Figure 5]. Figure 5 illustrates that high PE ratios have generally been consistent with lower 10-year returns, and vice versa. Currently, the S&P 500 PE ratio lines up with the historical average gain for stocks over the next 10 years of about 8% (based on the S&P 500). 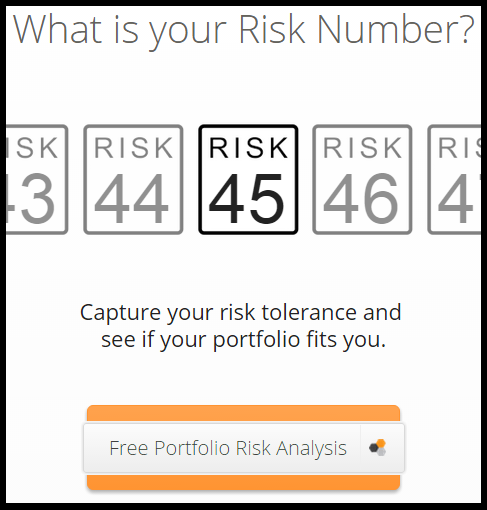 This gain is above bonds and most other alternatives (and worth more than the nickel that Berra once famously said wasn’t worth a dime anymore), but is probably shy of what some would hope to receive, given the risk that may come with it. We still think stocks will be the best place to be in the long term, but there will be bumps in the road. Although our expectation is for stocks to stage a solid rally between now and the end of the year, there are certainly risks to that view. One risk that may have increased on Friday, with news of House Speaker John Boehner’s resignation, is a potentially difficult debt ceiling negotiation later this year. We still believe a timely resolution is the most likely outcome and the U.S. will not default on its debt, but a brief government shutdown is possible this week and there will be headline risk later this year when the Treasury hits the debt limit. Concerns about the Federal Reserve (Fed) may have eased some following Fed Chair Yellen’s speech on Thursday, September 24, 2015, where she essentially reassured markets that the economy was likely to be strong enough to support the start of Fed rate hikes by year end. Perhaps more importantly, Chair Yellen assuaged fears that she and the Fed know something about China that markets do not. We do not expect the Fed to derail the bull market. recession, it will be critical to watch the global credit markets for signs of spillover that could impact the U.S. economy. Yogi Berra will long be remembered for both his accomplishments on the baseball diamond and his famous sayings. We can look to these Yogi-isms to remind us that this bull market ain’t over ‘til it’s over. Stock market corrections, and rebounds, happen—like déjà vu all over again. And although the future may not be as bright as it used to be, we suggest you stick with your game plan—and with equities. ← What Will They Say?